Yes, another one of these. So far, I like this bi-weekly schedule I've got going. It's not too frequent, but frequent enough to make it worth while. If we get anything less than 10v10, I'll knock the number of sectors down to 4 or 3 on the map. 5 sectors with 8v8 is just too many and can lead to lopsided quick matches. So far, I've been avoiding mining plant, bomber command, and missile sectors out of fear they would make matches too unfair. However, I will try to choose a map with at least one of these types of sectors in the attempt to make GAA and BMBs more important. Please let me know if you're coming in advance and don't forget to invite people! Edited by mnbv_fockewulfe, 11 February 2019 - 11:49 PM. Excellent. Sign me up. Sounds fun. when you join the discord server, click the "NA" reaction button to give yourself a role so you can join comms on saturday. also, does the suit protect you from profanities? Great fun, count me in. p.s. focke, I only switched to an A26B midstream last time because there was only one other bomber in the mix and thought it would make it easier for you to balance. ha ha, no problem, playing the mm is hard. There is a 90% chance I will be there so count me in. Had fun the past few. Maybe this time I will get into the top 6 in at least one battle. Probably I ll be there. The last one was far more fun than the game. Thanks for the effort of organizing these events. You and I both know it is a Fur suit, cleverly disguised as a hazmat suit. I'll come die fer ya's! Maybe instead of begging for prizes for these events, it could be setup somehow that at least we didn't get charged to fly in the training room (minus any gold items)? I know most of us that have been participating have plenty of coin but it might draw some others in that are still coming up through the ranks. Very much looking forward to this lil shindig, beings I missed the others. Won't be missing this one. 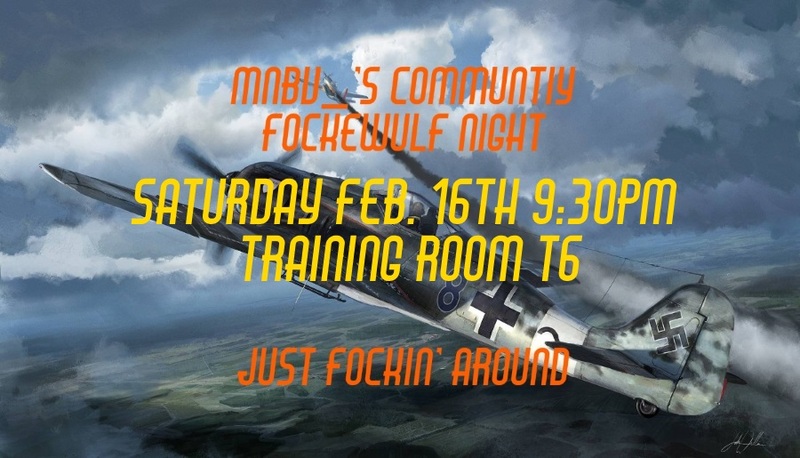 A big o7 to the organizer, Fockewulfe, for putting this together. Shame this can't be done by WG. See you in the pixel skies. Shame this can't be done by WG. NA office was shut down, and pretty much every CA jumped ship... there isn't anyone there to run stuff. I don't understand why we don't have any native replacements yet. 50/50 That I’ll be there! I can make it if you have room for one more. Should be even more fun now that the JS *crap* is fixed.